Dr Hemant P Thackeris renowned in the field of General Medicine with vast experience of 35 years. Dr. Hemant P Thacker is an eminent Physician practising in Mumbai. In addition to general Medicine and Therapeutics he specialises in Cardio-Metabolic disorders, and has more than three decades of experience in this field. After obtaining the MBBS degree from Seth GS Medical in 1978, Dr. Thacker did his MD in Medicine and Therapeutics from KEM Hospital in 1982. Dr is a member of the Royal Society of Health, London, and was awarded a Fellowship of the American College of Clinical Endocrinology (FACE) in recognition of his meritorious work in Diabetes and Cardio-Metabolic disorders. 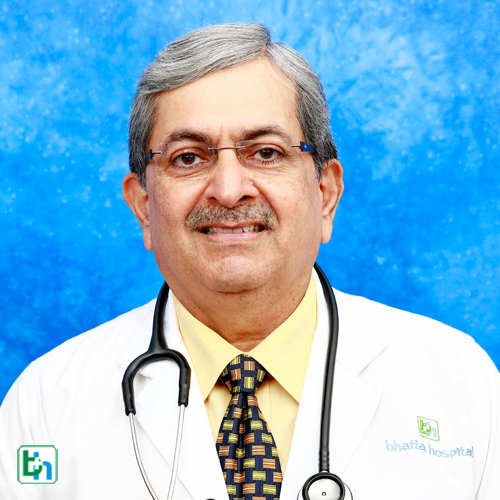 Dr has a wealth of experience, having worked as a Consultant Physician and Cardio-Metabolic Specialist at some of the most prestigious hospitals in Mumbai, such as KEM Hospital, Jaslok Hospital, Breach Candy Hospital, Bhatia Hospital and Saifee Hospital. He is the Chief Medical Advisor at Bennett Coleman & Co. Ltd and Northern Marine Shipping Division and the Medical Consultant for Mondial Assistance, a Paris-based International Insurance and Health organisation. Dr has been the Principal Investigator in more than 35 Multicentric, International and National studies. He has published several papers, and written textbook chapters and articles in reputed medical journals. Principal's Prize for the Best Student of the Year. Jai Hind College, Mumbai -1974. Awarded the Vasant Phansalkar Scholarship and Gold Medal in Pharmacology for standing First in Pharmacology at the Second Year MBBS examination conducted by the Bombay University -1975. Prize for the Best Intern of Seth GS Medical College and KEM Hospital - 1979.